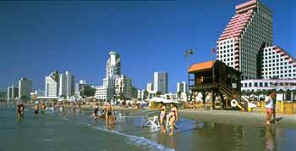 Tel Aviv is a modern city with skyscrapers and hotels that overlook the Mediterranean Sea. Tel means, “mound,” as it is used in archaeology. Aviv means “Spring.” The name of the city shows the blending of the old and the new which is the spirit of Israel, and its people. Tel Aviv is Israel’s commercial and financial center. Headquartered there are most industrial and agricultural organizations, the stock exchange, major newspapers, periodicals and publishing houses. Tel Aviv, the first all-Jewish city in modern times, was founded in 1909 as a suburb of Jaffa, one of the oldest urban settlements in the world. In 1934 Tel Aviv was granted municipal status, and in 1950 it was merged with Yafo, the new municipality absorbing the older town. The area around the ancient port of Yafo (Jaffa) has been developed into an artists’ colony and tourist center, with galleries, restaurants and night clubs. Tel Aviv is the first all-Jewish city in modern times. Originally named Ahuzat Bayit, it was founded by 60 families in 1909 as a Jewish neighborhood near Jaffa. In 1910, the name was changed to Tel Aviv, meaning “hill of spring.” The name was taken from Ezekiel 3:15, “…and I came to the exiles at Tel Aviv”. Today, Tel Aviv is Israel’s second largest city (after Jerusalem), with a population of 360,000, and among the big city problems it shares is traffic congestion. Things are more spread out in Tel Aviv than the smaller cities, but it’s still often easier and faster to travel by foot. The Shalom Tower Constructed in 1957, the building’s observation deck – 433 feet high, the tallest building in the middle east (at that time), is in Tel-Aviv. Jaffa is an ancient port city – Tel Aviv grew up around it. Jaffa has been a fortified port city overlooking the Mediterranean Sea for more than 4,000 years. It is one of the world’s most ancient towns. It has been the target of conquerors throughout the ages because of its strategic locations between Asia, Africa and Europe. Tel Aviv is the transportation center of Israel and the main hub for bus and rail stations.